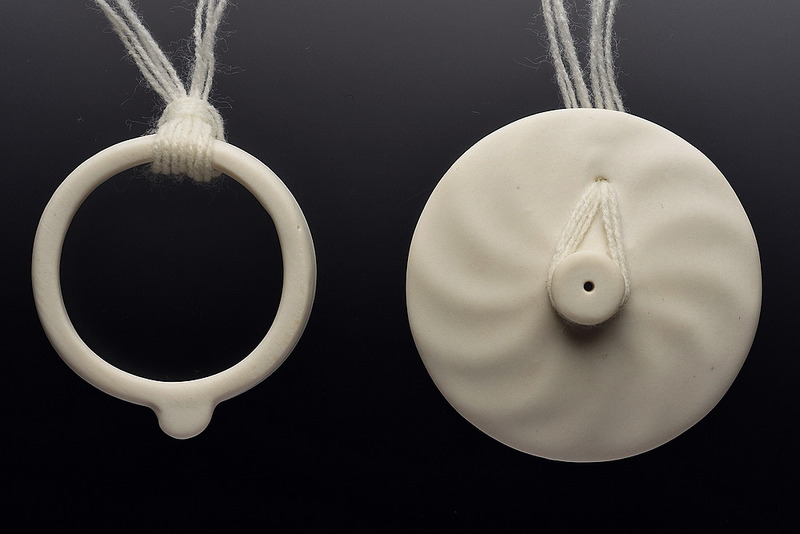 "After having lived and studied in both China and New Zealand, Jun Xie is currently approaching a cultural fusion through contemporary jewellery making. With inspirations accumulated over a couple of years life experiences in New Zealand, Jun has been capturing all kinds of natural moments and playing with possibilities to remodel them into a permanent form. 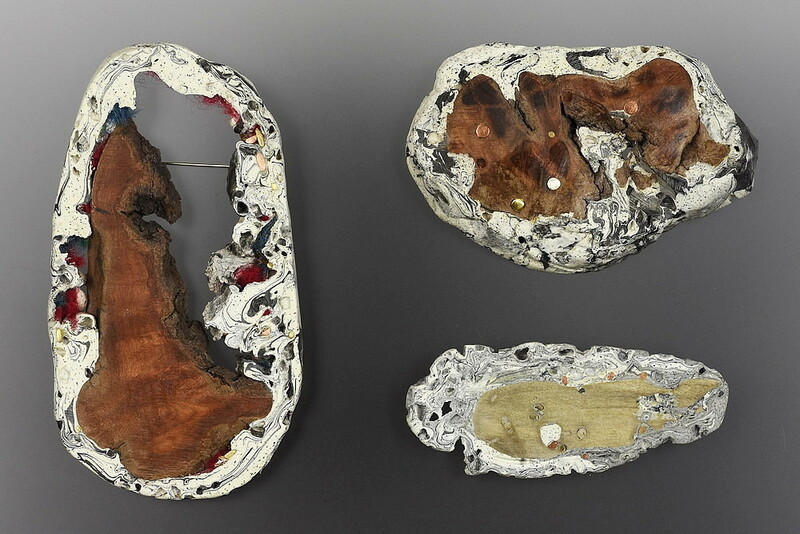 Since coming from a far country with specific culture, each piece of her works turns up like an encounter. There is always a struggle for absorbing what we have experienced outside while we try to remain what have rooted inside." 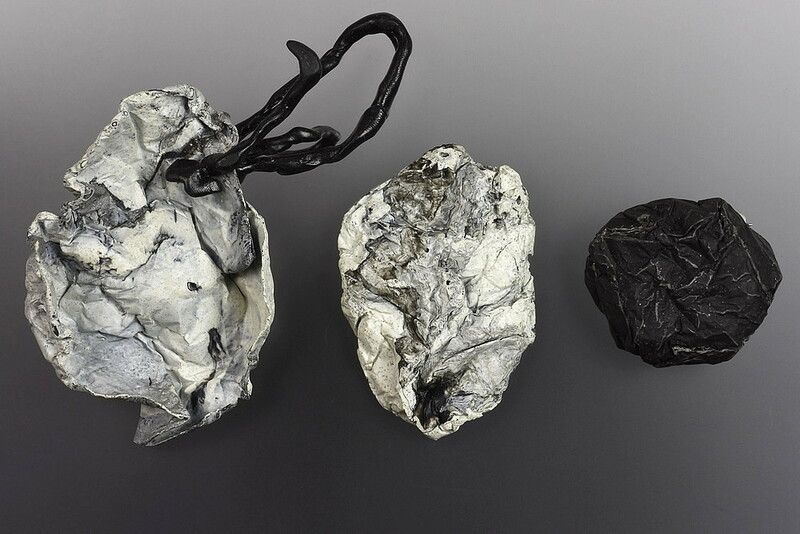 "Jun-Xie’s end-of-year exhibition work for the Finger award was selected by a panel of experts: Justine Olsen (curator Te Papa), Courtney Johnston (director The Dowse) and Sian van Dyk (curator The Dowse). Their vote was unanimous. Over the last 3 years we have seen Jun grow in her artistic capability. Her hard work and her inquiring mind that is eager to find out, research and experiment gave her a lifelong creative toolkit. 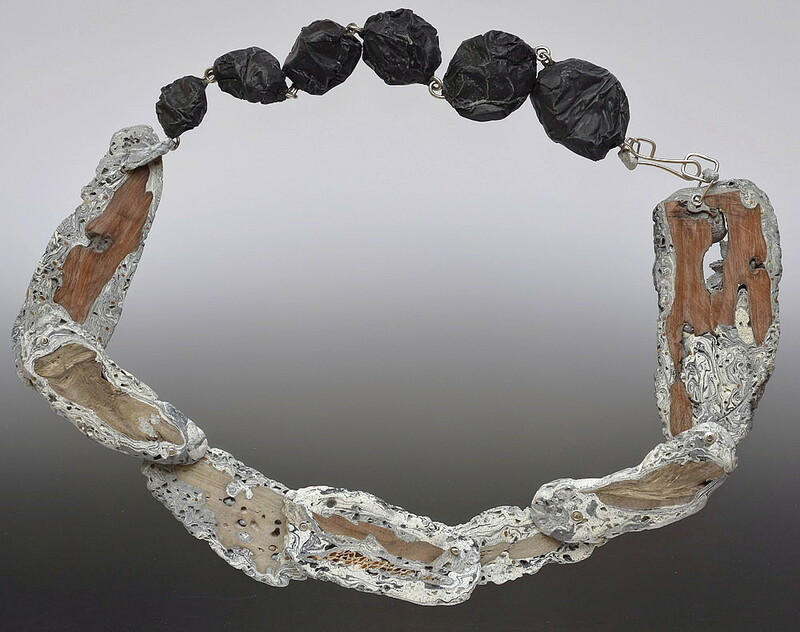 She is a creator of ideas where material transformations find new forms and connections to the body. Her many visits to NZ’s unique countryside gave her the focus for her unique creations." 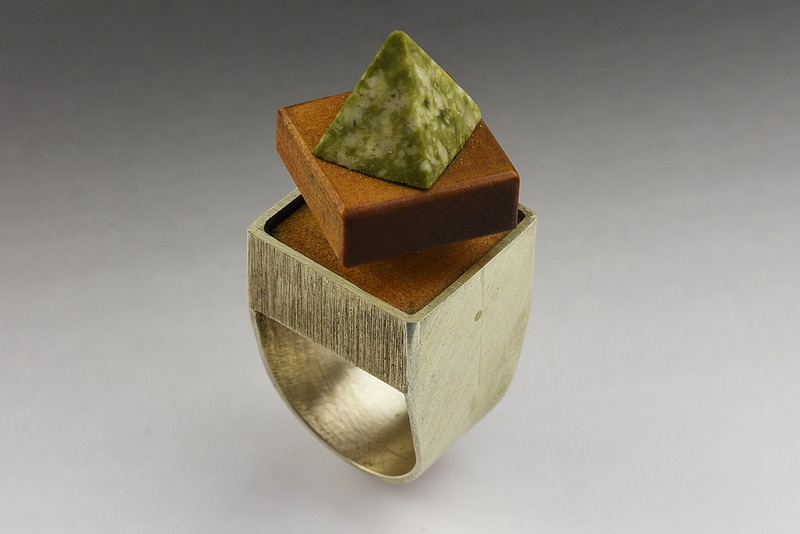 "In my practice I focus on jewellery that provokes thoughts about environmental issues. I challenge people to recognise our physical presence and connection to the land. We must take responsibility for actions and develop a respect for all of life. I seek to use my work as a catalyst, sparking discussion, engagement and exploration of possibility. Our problems are in this moment and so my work embodies references to the natural world but also they are built constructions that make use of current technologies. I enjoy discovering solutions to problems whilst making so the work is also process driven. This body of works is a group of kinetic rings whose movement is created through body movement, gravity, and the use of ball bearings. 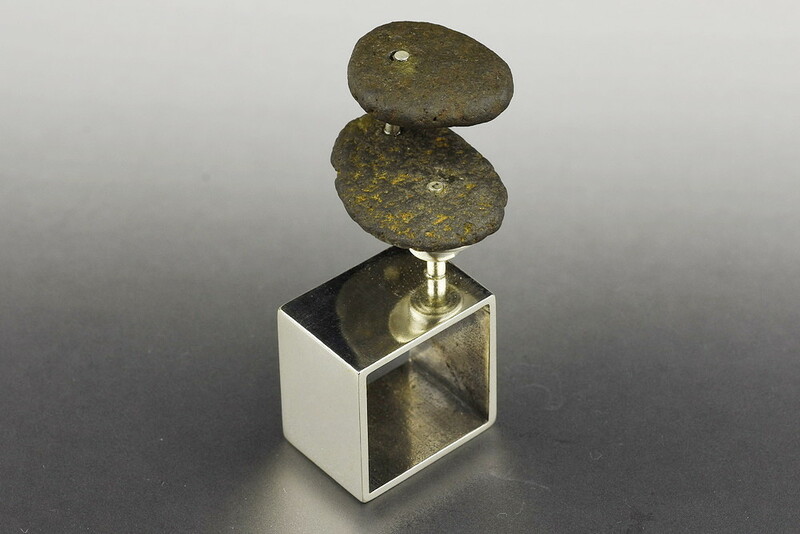 I am using ethically sourced sustainable materials where possible, such as reclaimed silver and wood, stone and found materials." "James has spent four years studying at Hungry Creek. 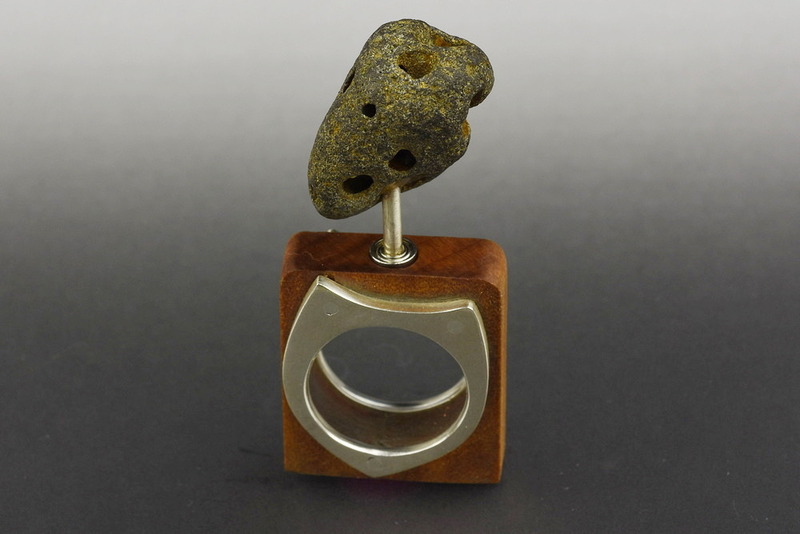 He is a second generation jeweller from a jewellery making family and arrived to study with existing skills. Adding to knowledge you already have is exciting but also creates uncertainty and demands risk taking. 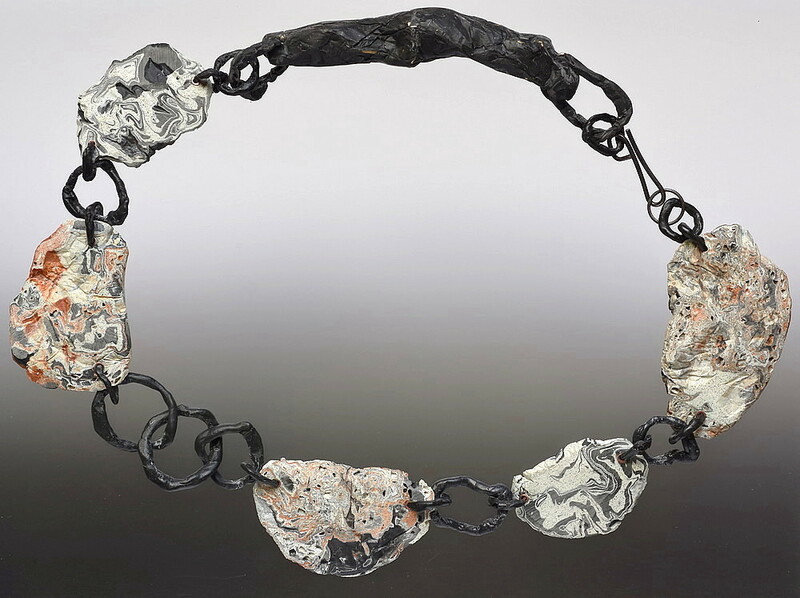 It is to James credit that he was courageous enough to commit to the project he wanted to investigate with his jewellery and be open to the new possibilities of how his jewellery was going to look and relate to people. 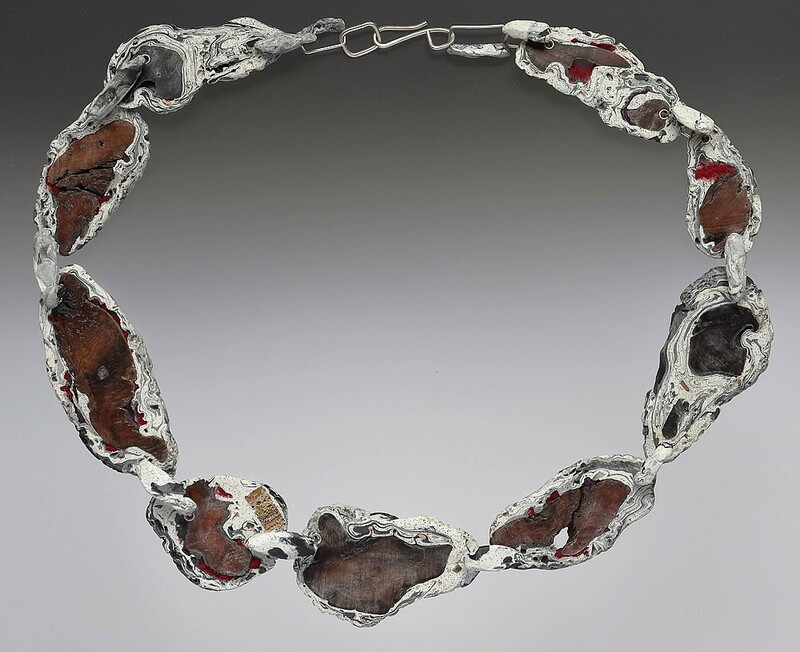 His synthesising of his philosophy of peoples place and responsibilities in the natural environment, science and technology and his love of jewellery has lead to exciting works being made. As teachers it is a gift when a student’s work engages you with the unexpected and the process of supporting them becomes full with anticipation. James’ work was always an adventure. We wish him all the best in his future and look forward to seeing the new jewellery inventions that develop." "My pieces talk about playfulness, freedom, carefree exploration, positive and negative space, material, pushing boundaries and not playing by the rules. Being a sole parent has taught me to be free with creativity; watching my son's creativity and desire to not necessarily play by the rules provides the foundation for my methods and processes in this work. 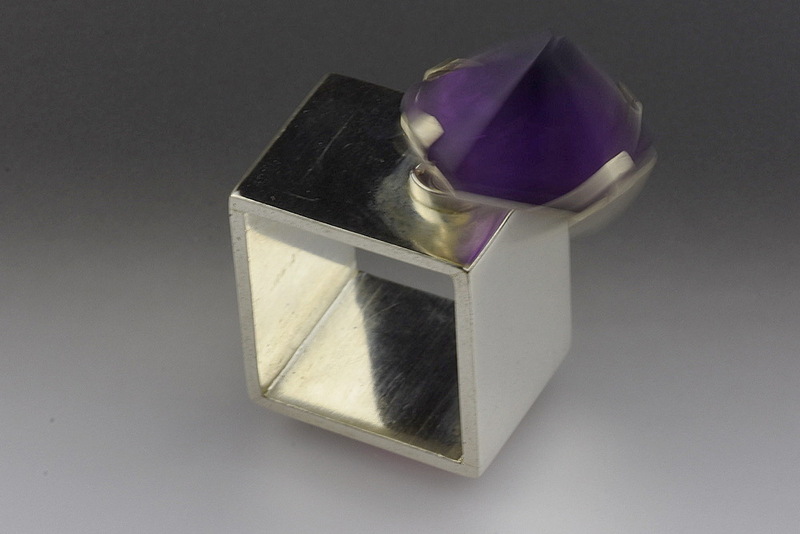 I am a hands-on maker, I create from pushing boundaries and direct material investigation. 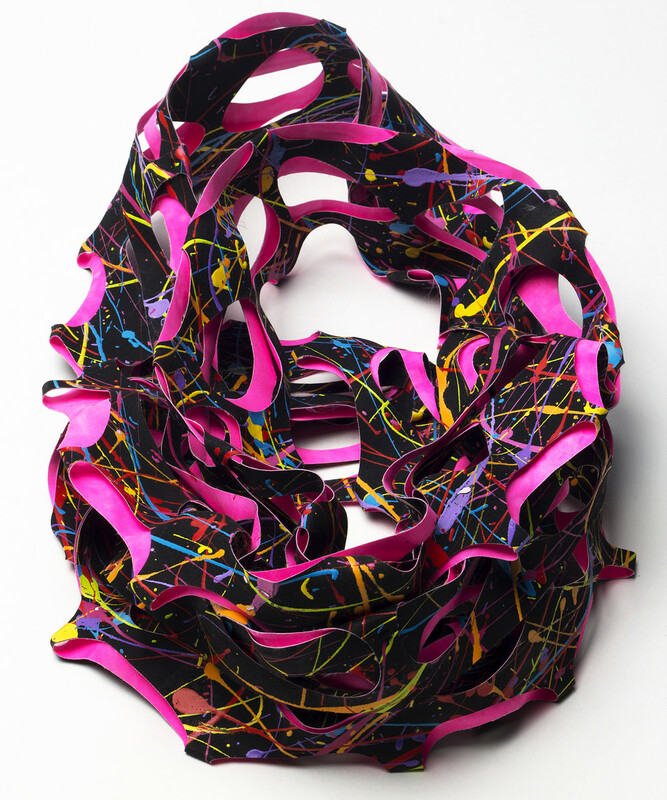 In these pieces, I am representing a playful 'not playing by the rules' exploration of brightly painted surfaces (paintings) and the 3D jewellery objects they can become. 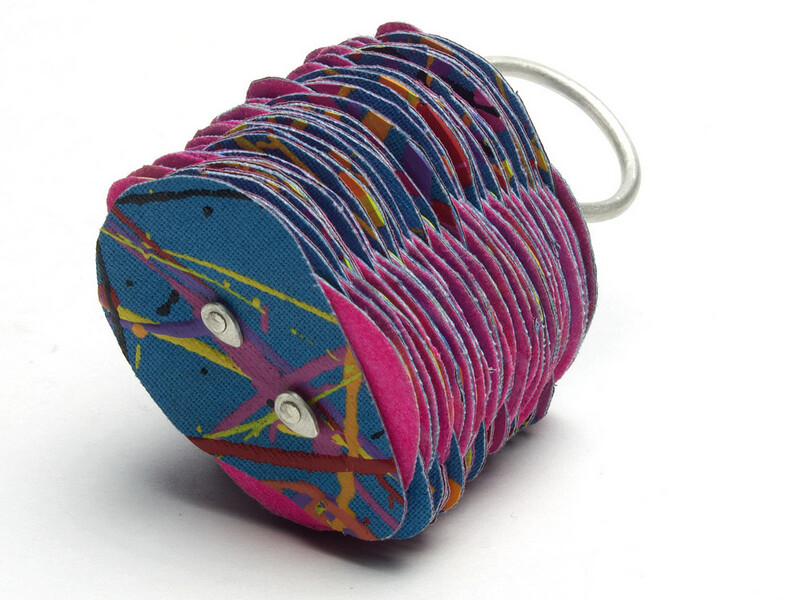 Working with fabric and paint and translating this into jewellery allows me to run free with my imagination. 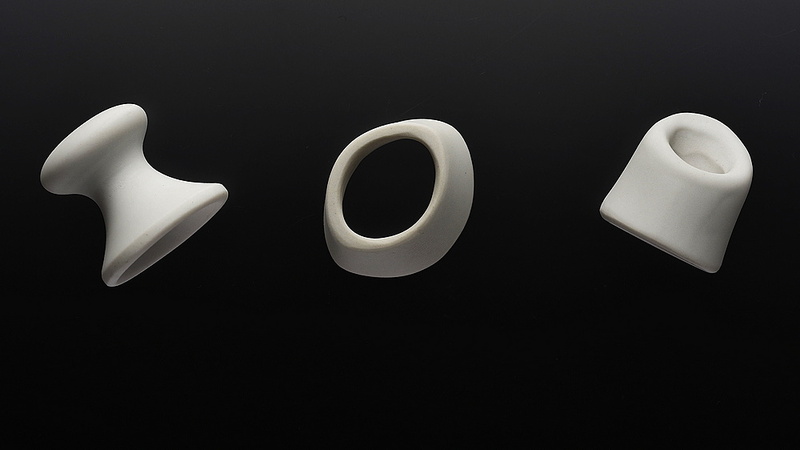 The process of making, of repetitive cutting of a multitude of the same shape, gives me time to reflect on decoration, on positive and negative space, on the decorative and meaningful role of jewellery objects. This way of working also allows for a 'give it a go' attitude on what comes next. 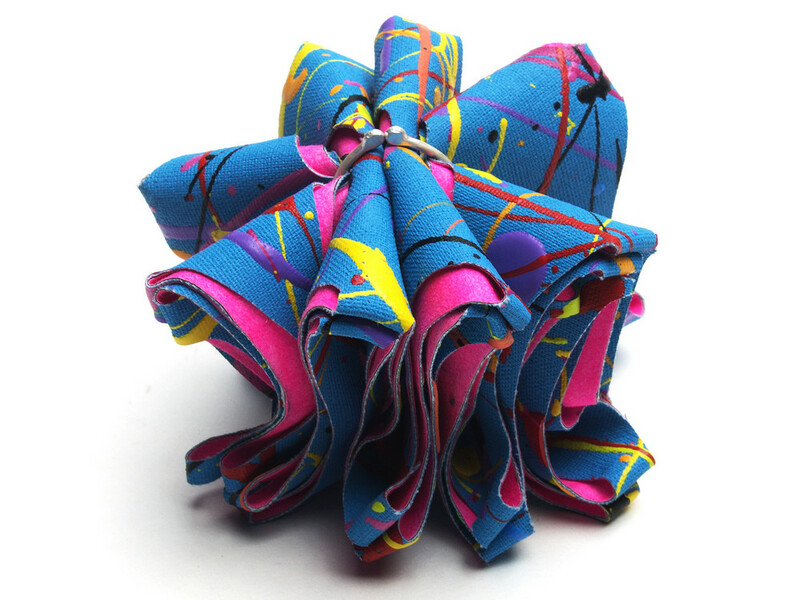 The fabric is first painted in bright playful colours. Each painting is then hand cut and then formed into a piece of jewellery creating a new hybrid, painting/piece of jewellery. 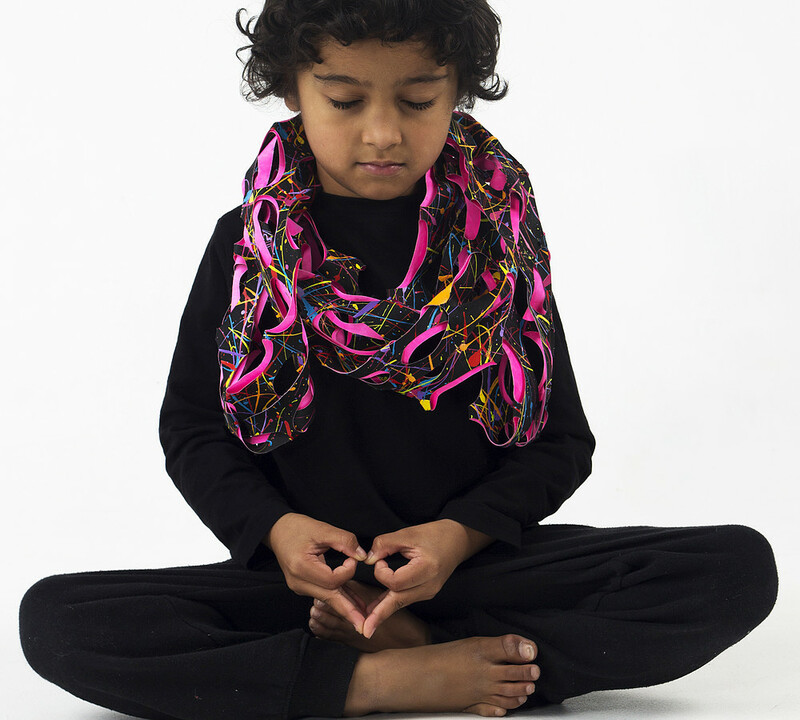 Everything is wearable and anything can be a piece of jewellery." 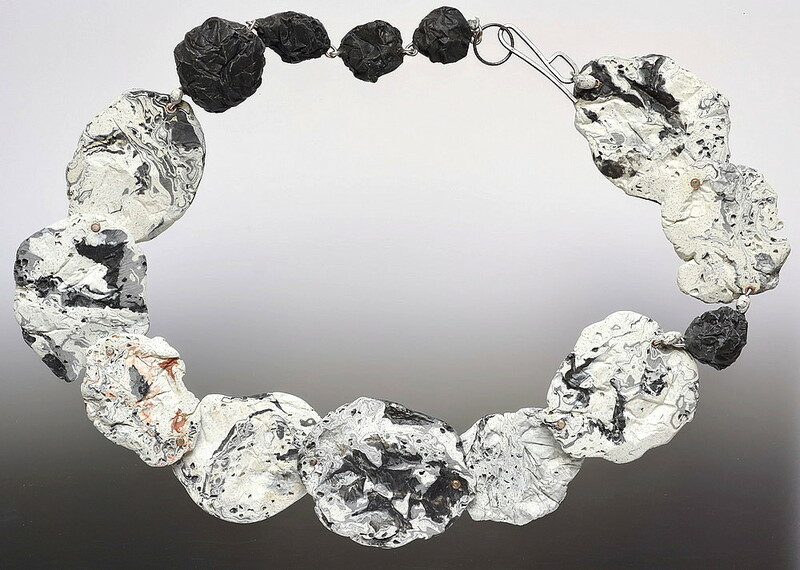 "We chose Monika Fraider to receive the Fingers prize as we felt she would benefit from the opportunity this prize presents and her exciting end of year submission and inventive approach to material exploration warranted it. Monika has approached the making of this post degree body of work with commitment, taking full advantage of this opportunity to explore her graduating work further. 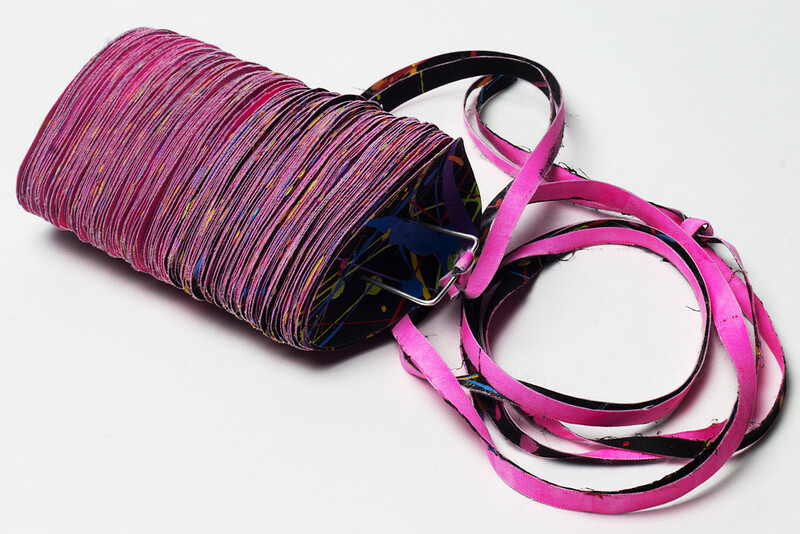 She has continued to use textiles and her method of re-examining the interaction between object and wearer through photographing her son Rikos responses to the works has continued to play an important part in the development of her ideas. Monikas new work is inventive and engaging. We believe she will do well in the future." 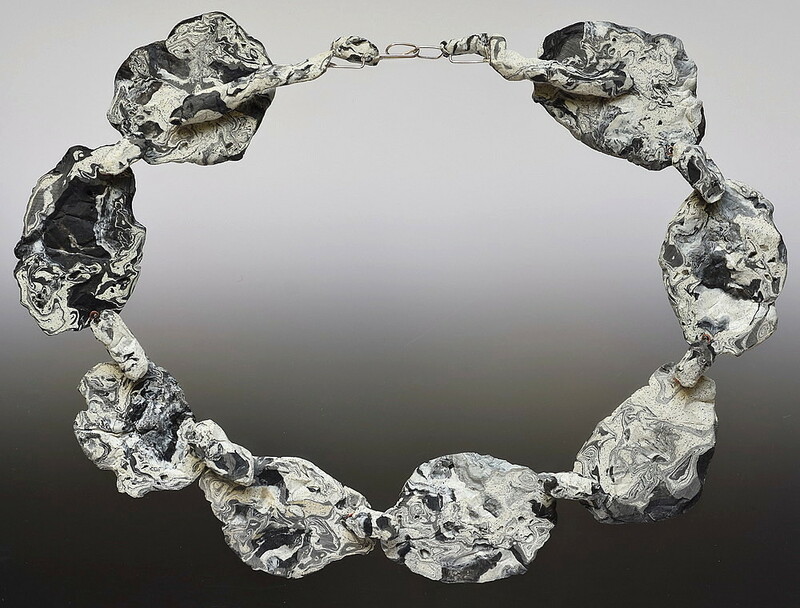 Textiles, house paint, fabric paint, sterling silver. Moveable and adjustable. "It is instinctual to reach out and grab an object by the handle. Our first reaction is to pour the contents of a vessel from its spout. 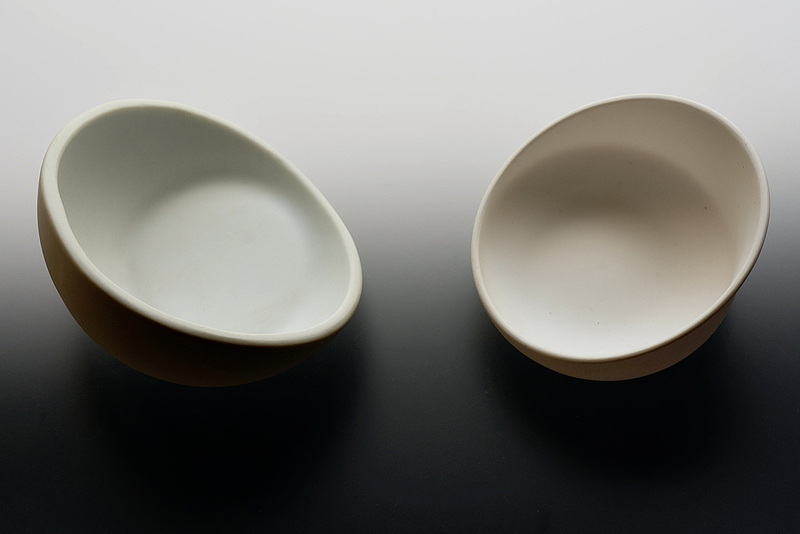 What is it in a vessel’s design that conveys such implicit instruction on its use? And what happens when that use is interrupted? 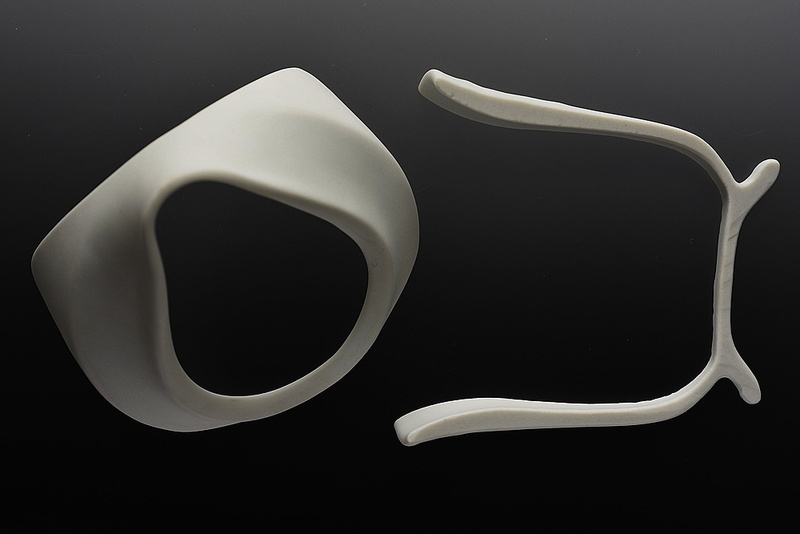 Extending from my graduate project, these works further my exploration of the forms found in everyday household tea sets. 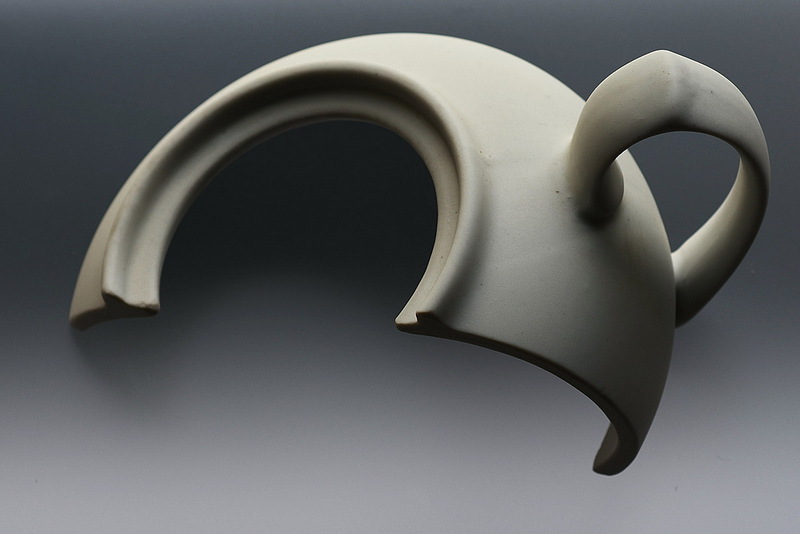 After looking closely at our daily interactions with vessels, and more specifically at the rituals around tea, I became fascinated with the way a vessel’s form reflects, and is shaped by, its desired function. 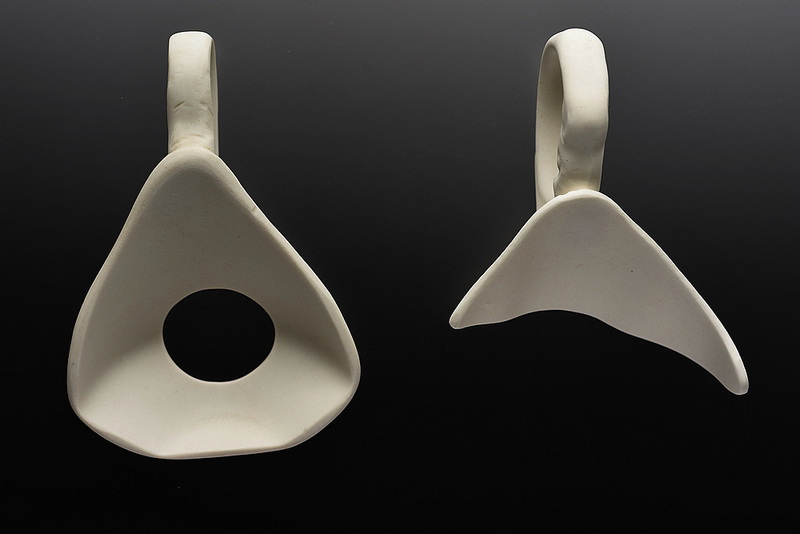 By manipulating the forms of second-hand and found porcelain, I discovered ways of transforming the function of the vessels from tableware to jewellery, and to use the existing shapes to suit this new purpose. A teacup handle becomes a brooch pin; the knob from the lid of a sugar bowl turns into a ring; the spout of a teapot becomes a necklace. When you consider it, the possibilities are endless and while it was instinctual to see everyday objects as just that, now I hope people will look with new eyes and see what else can be found." 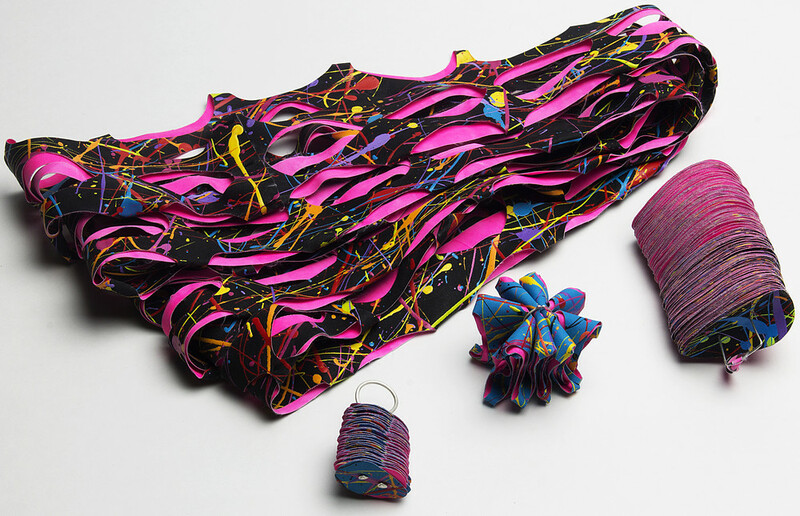 "Emily's graduate folio featured deconstructed and curiously reassembled china cups. 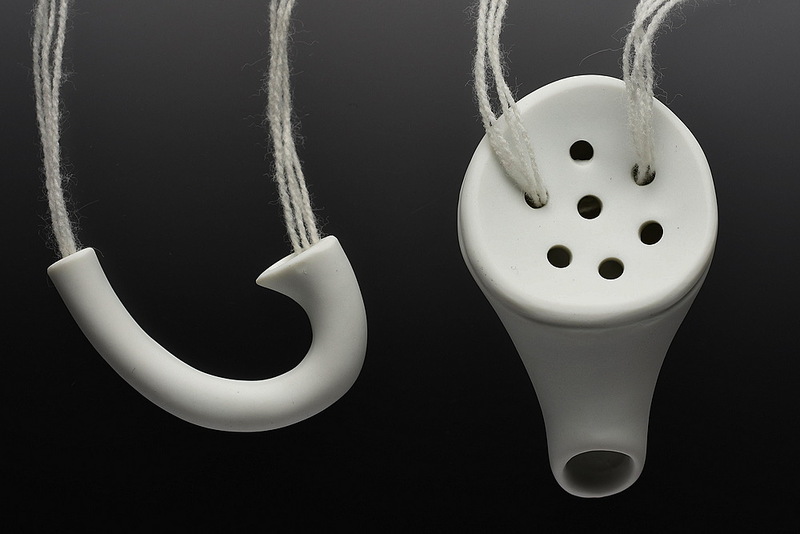 The project had its origins in a second year exploration of utilitarian objects in a visual arts arena. Emily crocheted a tea service and performed a dada high tea with the dribble some vessels. The graduate work began with the ambition to facilitate social interaction using similarly silly utensils. 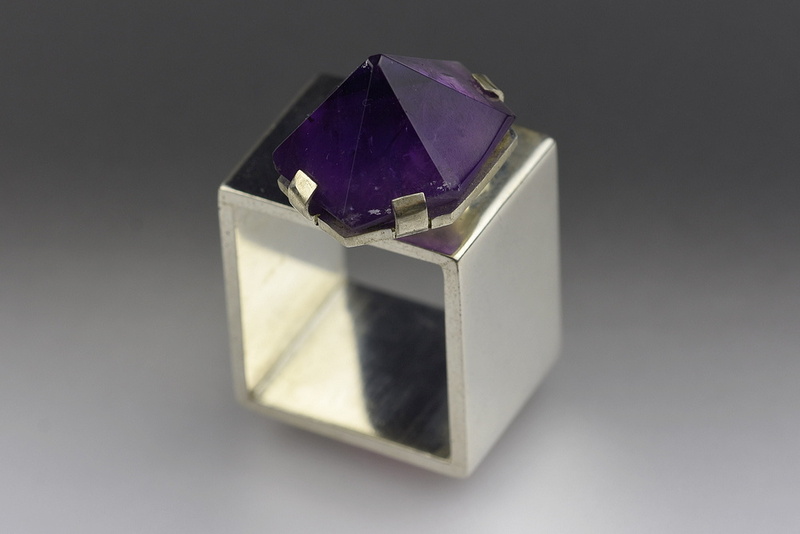 Emily's work evolved into a collection of objects and jewellery that enticed her audience to look critically at objects we usually dismiss through their mundane familiarity."